Owen Lars and Beru Whitesun raised Luke Skywalker. But had they adopted him? Luke calls them uncle Owen and aunt Beru. He knew of the family relation between Owen and his father, Anakin. Yet the Skywalker family tree on Wikipedia (since corrected) shows a dashed line from Bail and Breha Organa to Leia, representing the adoption, but shows no such line from Owen Lars and Beru Whitesun to Luke Skywalker. 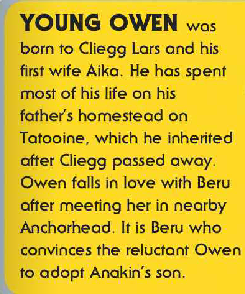 Had Luke Skywalker been adopted by Owen and Beru? Was there any need to formally adopt him? but on a world as lawless as Tatooine, it's not clear whether there's even a formal mechanism behind this. Certainly they raise him as 'Aunt Beru' and 'Uncle Owen' and we know that he's very well aware that they aren't his parents. My instinct is that this is the sort of informal adoption arrangement you'd expect to find in any 'New Old West' environment. Not the answer you're looking for? Browse other questions tagged star-wars a-new-hope luke-skywalker or ask your own question. Why would Owen and Beru even consider allowing Luke to join the Imperial Academy?